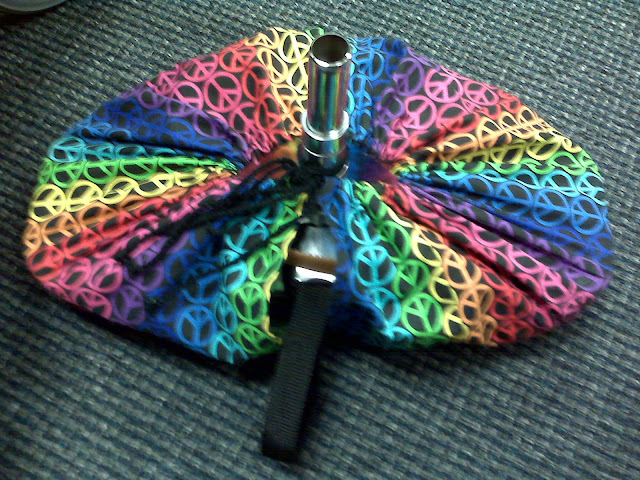 I loved Krystal's seat cover idea. She should sell them. Would be helpful in the summer time to have air between you and the seat. I did call the airlines but I needed help getting into the airplane. They did say on the phone to talk the ticket folks but I had my boarding pass already,the ticket line was long, so just went on to security. I told the security folks that I could not stand without assistance and I could not take off my shoes, so they did a special pat down on me, a few wipe sample on the scooter (don't have a clue what they were looking for). I went on to the gate and talked to the gate counter folks. I explained that I need to gate check my scoot since I cannot walk and needed help getting to my plane seat. As I mentioned before, I said "It is recommended that I take this little battery in my carry on." It is the smaller one and they just wanted to know if it was sealed or not. It is very sealed and much like a laptop battery. With the battery removed it weighs no more than a kid's car seat or some strollers. No problems at all and it was waiting for me when I came out of the airplane. I have traveled extensively with the scoot, and never took the canvas bag. 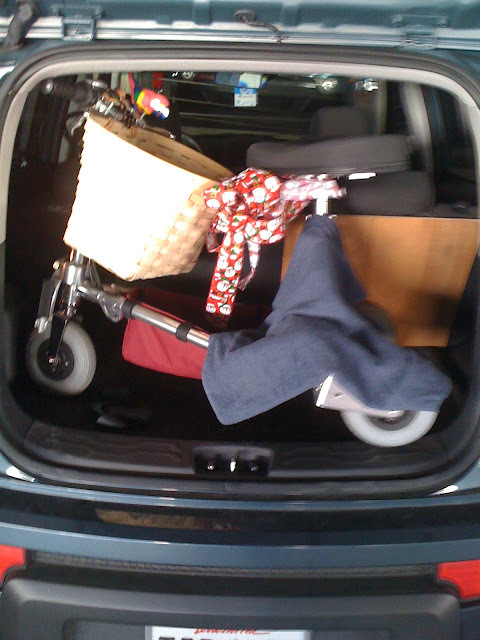 When traveling by car, I do have to fold the scoot up to put it in the trunk, but it is not difficult at all to take in and out. No need for the bag. I have also transported it in the back seat of a car, fully assembled. It is very flexible. You might want to take a spare belt (and know how to replace it) and maybe a spare connector. I have not yet cruised with the scoot, but many have and there is a cruise site that talks extensively about cruising with the travel scoot all positive. I did try a cruise with a folding transport wheelchair and the bag was shreds when it arrived on board. For my trip next month to Disney, I may bring about 8 feet of lightweight rope, just in case I get a power failure and someone needs to pull me back. Thats a big place, but I might just leave the scoot and one of their rental places and use one of theirs. That worked at the State Fair last year. I also give a thumbs up to the Peterboro basket. I got the xlarge Cherry one too and am finding it to be so handy. It's roomy and holds a lot. I use my TS to exercise my 2 puppies and have used the basket to hold the female who needs a ride sometimes. So glad Peggy put that info out there for us. ScooterMama - now that is a great name!! I am sure that every one of us has experienced the things you have mentioned. I don't even look back if I think I have knocked something over - who me???? I always charge my battery after an outing bacause you never know where the next day will take you. I have the Lion battery and have not often seen the amber light, but it would make me nervous. I tend to always ride with my hands on the brakes bacause I am in New York City foot traffic every day and people do not look where they are going. WATCH OUT is what I yell at those people who step in front of me and you would be surprised at how quickly some of them can jump. I never apologize - I always look our for myself and everyone else should, too. I have had some close calls, but never my fault. I have gotten really good with doors. If I see that they open towards me I ride up close to the left opening side of the door and make a little bit of a right turn at the door, use my left hand to open the door while backing up and turning the fromt wheel towards the door. I always go throught the left side of double doors, no matter which way they open. Every door is different, but I am usually able to scoot in without hitting myself with the door. Some doors (those I am familiar with) can be opened with your foot by pushing on the door while very slowly accelerating. Keep in mind that I am extremely coordinated - some may not be able to do this. Have you thought about having the seat reupholstered? I have and I would use memory foam, like a tempurpedic mattress. You may have to buy a larger piece than you need for this, but you could always sell the rest of it to TravelScooters for the same use. I agree - I have a tired bottom after sitting on the scoot for a while. Not a very good photo - Fred took it yesterday at a local mall, and I think he moved the camera! We took two of our granddaughters to Barnes & Noble, for lunch, and then to the movies. Between lunch and the movies, we had some time, so went to the mall so the kids could see the TravelScoot. I had shown it to Megan (our oldest of 5...she will be 10 in March) on-line before it arrived, so they were anxious to see it in action! I even let her ride it, but she got off right away! We took it into the theatre, and I drove it down the ramp and to our seats. She spotted two chairs off by themselves (obviously a lot of space around for scooters and such) and said, "Mimi, let's sit here and park the Scoot right there! " She's a special child...from the day she was born, people have called her an "old soul," and she is that and more. I told her we could park it there and walk over to the next row of regular seats, but where we could keep an eye on the Scoot! While at the mall, she wanted to go to AC Moore or WalMart to pick out a pattern for a soft basket and seat cover for her mom to make for me...but we ran out of time! So, I just ordered a soft basket from Scooterville. I hope it works out OK...need something for our cruise on 2/3. The metal wire basket I bought from Tony is kind of a pain. As I found out today; making a seat cover of something "slickery" would allow mounting and dismounting easier...my pants kept hanging up on the current seat cover and then I'd have to "fedgit" around to reposition everything and ones balance becomes impaired during this process and well you get the picture... a seat cover that's kinda slick would off-set the "drag" of pant materials. Still learning about this new tricycle of mine. Getting in and out of non-automatic doors (bathrooms) is a real trial. But valet parking is a real boon--they unload and load the scooter! (an extra tip is always required for this I think). Hanging out with my tricycle today. And where do you carry the spare belt? As an old bike rider, I like to have things handy “just in case” so I got to wondering – how do I carry the spare belt? I have the tools (and a copy on how to change the belt in the tool pouch) attached to the V-bag. There must be a way that won’t fold, spindle, or mutilate the belt. 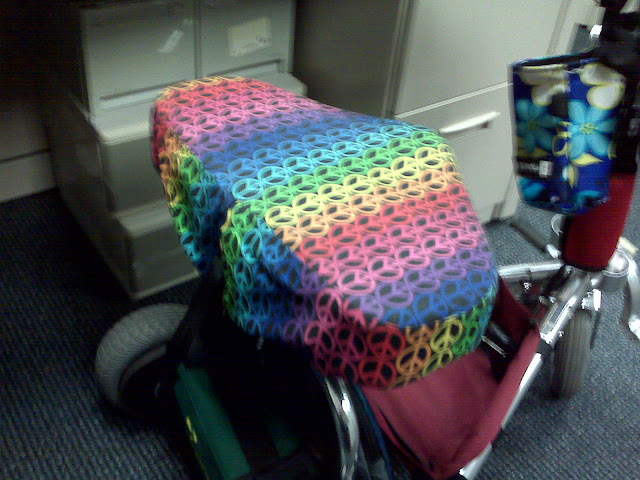 Being a crafty person, I decided that a new seat cover was in order. And that’s when I also figured out just where to carry a spare belt. I’m working on my second cover as I realized that there was too much cloth on the back. 1) Using newspaper (so you can make adjustments and have a pattern to make more), place the seat face down and trace. Add a half inch for seam allowance. 2) measure around the outer edge of the seat and add one inch. Now make a strip of newspaper the length of the outer edge+1 and about 9.5 inches wide. You might want to taper the ends for the last 8 (or so) inches or so to keep from having that puff in the back. I’m trying a two inch taper. Your pattern is now created. For the small seat, it takes about 2/3 a yard of 45 inch material and 3 feet of cord for the drawstring. I’m not sure about using stretch stuff. When putting the pieces together. I found that it is best to finish the ends of the side piece – quarter fold, quarter fold. Do a quarter inch then half inch fold for the drawstring casing along the un-tapered edge of the side piece. Then sew on the top. (Don’t forget to center the side piece to the center of the front of the top. This creates the slit in the back for the seat back.) I added a second seam around the top of the seat to give it more strength and to hold the seam allowance in place. Thread the drawstring through the casing. That’s it. E’voila! A new seat. Just think, now you can make ones to match your outfits and the seasons. Yes, that’s what I’m planning. I just realized also, that for everyone that wants more padding, if they made two copies of the top and put foam between before sewing that may help. In case you are wondering about the black strap poking out from the back of the seat. It’s a loop of belt webbing. Yep, it’s a handle. Hope the New Year is wonderful to you! We leave in a little more than a week for our cruise vacation, and, never having traveled with my TS before, we're sweating the details that can make or break a trip like this. Is there any reason or benefit notifying the airline ahead of time that you are bringing your 'Scoot? For those who have cruised, any excursion-managing tips would be much appreciated. Yesterday, we went to a nearby outlet mall, one of those big outdoor places in the middle of nowhere, where a large ring of stores surrounds a central parking lot. I did pretty well with the 'Scoot, making the full circuit of the mall and stopping in several stores. No way in heck I could have done that on foot! Knocked over a couple of small items that were hanging low in crowded aisles. No breakage, thankfully. At one point, on a down-ramp, someone suddenly stepped sideways in front of me. I did NOT have the instinct to go for my brakes, but I sure did holler! Fortunately, did not hit him. Guess I need to practice more using my brakes -- I rarely do, just release throttle and put my feet down..
At another place, there was no one to help with the door, so I got off and tried to pull Scoot thru the door with one hand while holding door open with the other. All of a sudden, Scoot was bucking like a horse! Either the throttle got stuck open, or, my hand was still on it, even tho' I didn't think it was. No harm done except to my pride, and people sure came running to help then! So it's prolly best, when confronted with a non-automatic door, to wait and ask for help. By the time we were done, my bottom was sore, even with the larger seat. Anyone have any ideas for padding the seat? I don't think just adding a cushion would be safe -- too easy to slide off. One thought - Junonia sells padded bike shorts - maybe they would help? My TravelScoot arrived this week. My husband put it together yesterday, after we returned from a week over on Nantucket, I attached the Think-King cup holder and hooks, and we were ready to go! We went into Boston to the RV show. In recent years, I've not done any of those things. His dream, when we retire, is to buy an RV and drive South or to AZ in the winter). Anyway, I (we) had a fabulous time...what freedom! We were there from 1 PM to 5:30...something I never would have been able to do before. Funny thing....I was inside a travel trailer, looking around, and looked out the door to see my husband zipping around on the Scoot, giving it a try! I bought the basket and it's on the back, and that will be fine for our cruise, but think that out and about at home, a bicycle basket on the front would work out better for me. It's truly an amazing little "vehicle." Two thumbs up for the Peterboro basket! 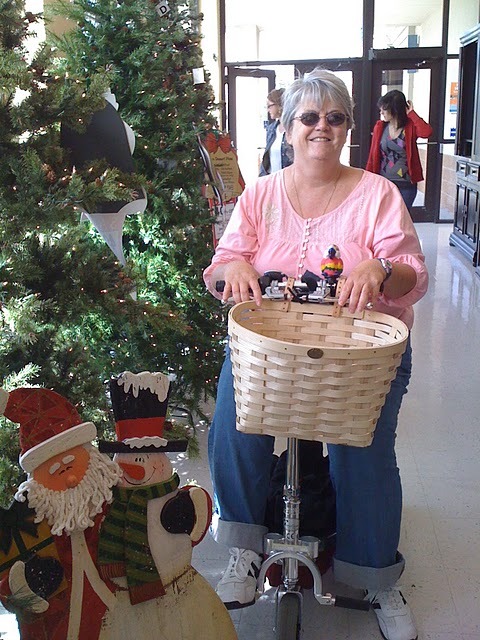 Peggy had a great idea with the Peterboro bicycle basket! I bought one of my own (the extra large one, in cherry), and tried it out yesterday. It has leather straps to attach it to the scoot and they fit nicely over the handlebars and fasten tightly. The basket didn't wiggle very much, and it held my sweater, purse, and the fabric I was shopping for at Walmart. 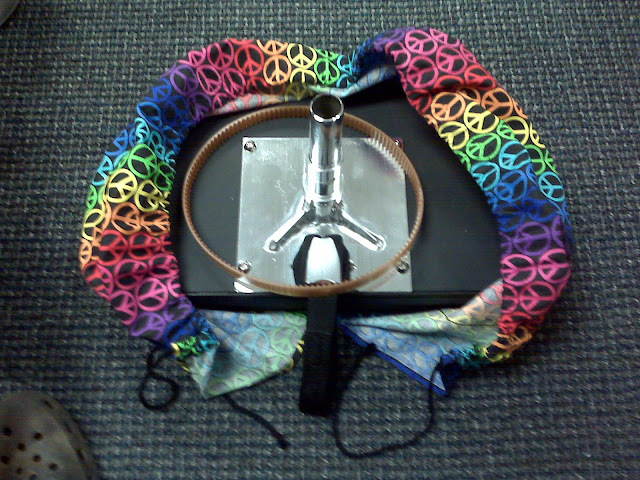 Look at the picture of this basket on their website (http://www.peterborobasket.com/p-1269-peterboro-original-extra-large-bicycle-basket.aspx ), and see where they have the leather straps attached. The only change I made was to move each strap more to the middle. I don't think I'd want to have this basket on my scoot all the time because I'm used to being able to pull up close to things and it's harder to do that with the basket attached. I'd definitely want this basket if I was out shopping though, because whatever you put in it is easy to reach. It does make the hand brakes harder to use because it's so close to them, but the only time I use the hand brakes is if I'm going down a hill and need to slow myself down. Any other time I just let go of the throttle and have no problem stopping. It's pretty simple to attach or remove -- just buckle or unbuckle the straps. I give it two thumbs up! 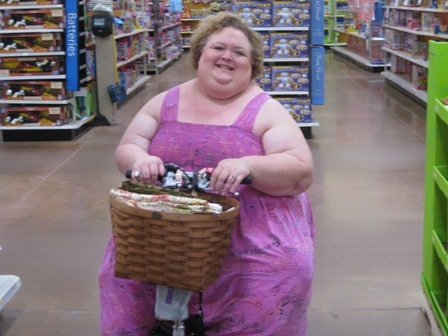 "The basket I purchased was the large one-cost $50. The leather straps are great. Play around with them and you'll figure out the best way to attach them to the handlebars. You can get the basket to sit level. I think the heaviest that I put in it was 2 half gallon cartons of milk." Peterboro has free shipping and right now you can get 10% off by using the discount code WINTER10. These instructions were written by Tony at TravelScoot. His email address is mail@travelscoot.com. Print these instructions and keep a copy with your spare belt and toolkit. Open http://sizepositive.com/changingtravelscootbelt.htm for a printer friendly version. - Remove the 2 screws attaching the aluminum belt guard from around the small gear (on the motor shaft). - Raise the left rear side of the scooter up (by placing a block of wood or something under the leg) so the wheel can be rotated by hand. - While applying side pressure to the belt (away from the wheel), turn the wheel backwards and roll the belt off the big gear (on the wheel). - With the two 5mm Allen wrenches supplied in your tool kit, loosen the axle bolts on the rear wheel. With luck the inner bolt will come out while the outer bolt stays in, but this is no big deal. - Grab whichever axle bolt is still in place and pull the axle out PART WAY until the wheel can be cocked enough to allow the drive belt to pass between it and the fork. - Get a good look how the belt is installed so you have an easier time installing the new one. - Remove old, install new. - Install the rear wheel, being careful to align the axle shaft with the holes in the wheel and fork. Tighten the axle bolts. - Place the belt over the small gear on the motor shaft. - Roll the belt over the big gear on the wheel similar to the removal process. - Check belt tension: the belt should deflect approx. 1/2 inch with moderate finger pressure. The tension can be adjusted by moving the belt tensioner pulley up or down. - Reinstall the belt guard. Align it so the bolt head for the small gear is centered in the hole. Otherwise the gear can scrape and make noise. No one should have this much fun riding on a scooter. Recently, I hit both Clearview and Lakeside Shopping Centers in Metairie. Target is in Clearview and I was all over the store. They had lots of things on sale. I was looking for warm knit pants. I think it's going to be a cold winter and Mardi Gras. I was able to go from one section of the store to the other without being concerned about getting tired. I did try to take a few corners too fast and there were other shoppers right there. The breaks work very well!! Lakeside was very crowded. I had to use a handicapped parking place because available parking places were on higher floors and I would have had to use the ramp. I wasn't sure how well Silver would handle going up the ramps, and wasn't ready to try. We handled Lakeside well. When I stopped to eat a very late lunch, someone nicely offered to help me to a seat. I said no thank you as I could place the tray on top of the basket. I remembered your blog about Nancy's food tray invention and realized that the top of the basket was flat. It worked well. The best thing about the basket is that I figured out ou a way to keep it on Silver while I put it in the hatchback. If you turn the handlebars around as you put them down, the basket faces the seat. I had to make sure the basket bottom was not hitting the the upright bar as I lowered it. Otherwise, no problems. It's so nice to not have to put on and take of the basket. That wasn't really a hassle, but just another step that can be eliminated in order to save time. The best thing about this 5 hour shopping excursion is that I wasn't exhausted when I finished! I actually enjoyed shopping. The basket is proving to be the second best investment; Silver was the first. I'm always careful with baskets but this one is proving to be as strong as the company says. It can hold my 11 1/2 pound Hailey as well as a few other items and is taking some abuse in moving it around on Silver. Remember the basket is from www.peterborobasket.com.